In mobile there was a big focus on creating and serving content that was appropriate given a user’s context. Context in mobile includes, time of day, location, device, keyword, or site. This can include responsive design, click-to-call, or many other tactics. The key is to understand and consider that even if a user is searching for “running shoes” they may react differently to that same keyword search at 6 p.m. near your store as opposed to 9 p.m. at home on their couch. The power of Google Now as a movement toward predicting a user’s needs, rather than reacting to them, is a big shift in 2013. Google Now will show you the time it takes to get to work without inputting the address, or pull flight information for scheduled events in your calendar. A key advancement in how we interact with our devices. AdWords enhanced campaigns removed the ability to target mobile campaigns separately and rolled together tablet and desktop. While this Google-forced change caused a lot of ruckus as it was announced, it has since become better understood. CPCs initially went up as much as 33 percent for our clients’ accounts, but most have since normalized. Overall, the change brought together a better focus for PPC managers around the customer’s user experience and is now a positive part of search manager’s daily lives. Twitter took a lot of steps in 2013 as they took the company public this year. One of the biggest steps was the addition of Lead Generation Cards. The ability to grab e-mail addresses and sign up users for loyalty programs enabled Twitter to have a stronger tie to business metrics beyond their typical ad formats engagement rates. In 2013 many properties started to upgrade or create their monetization strategy. Instagram was a lightning rod for ads being inserted in traditionally ad free spaces. Michael Kors was the first up in this space. His ad saw a 370 percent increase in likes vs. what he normally receives. Lexus got 10,000 new followers in one day vs. the 200 it normally sees. Expect to see more traditionally ad free apps insert ads in the coming year as revenue pressure comes from the market’s high valuation of these companies. We think this can be a good thing, but advertisers should continue to understand their audience before jumping into the fray. Is the ad space right for your audience and your business objectives (i.e., you aren’t just driving likes for the sake of driving likes). Companies in 2013 took big steps toward better tying their customer data to personalized email content. You see more and more examples of brands understanding their customers’ triggers and what they want to see to help them create stronger relationships with the brand. The ability to develop one page that renders correctly, regardless of device, is becoming the norm. This is key for not only the user experience, but also it is Google’s preferred method as it relates to organic search rankings. This update to include sections of images in tweets automatically was important. It provides users with deeper engagement levels and brands an opportunity to communicate with their followers visually. A tweet has 140 characters and a picture is worth a 1,000 words. A big character increase, right? This move also opens up Twitter to more traditional “display” advertising opportunities that I expect to come in 2014. Late last year Twitter bought Vine and rolled it into their platform, later Instagram also included a video feature although slightly longer in format (15 sec vs. 6). This short form video format requires brands to think outside of cutting up their TV ads for digital, but instead create new digital assets that fit the format exactly. The biggest digital story in 2013 in my opinion was early in the year during the Super Bowl blackout. Oreo, Tide, Walgreens, Audi, and others jumped in to create real time reactions in social spaces. This changed the way clients think about events and response times from customer service to marketing. This trend carried all year long and even included brands playfully interacting with each other, such as Oreo and Xbox. 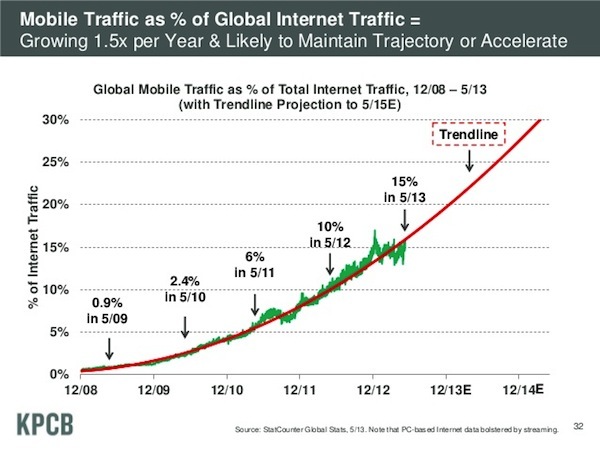 The bigger mobile becomes in all of our lives, the more innovation that will occur. Better devices, retail brands’ ability to react to mobile payments, Apple’s iBeacon, and other developments will continue to make mobile a key place to focus for marketers across paid, owned, and earned media.